What tastes better to Facebook Users, Dinner or Dessert? We address this question in our latest Karma Tagging. 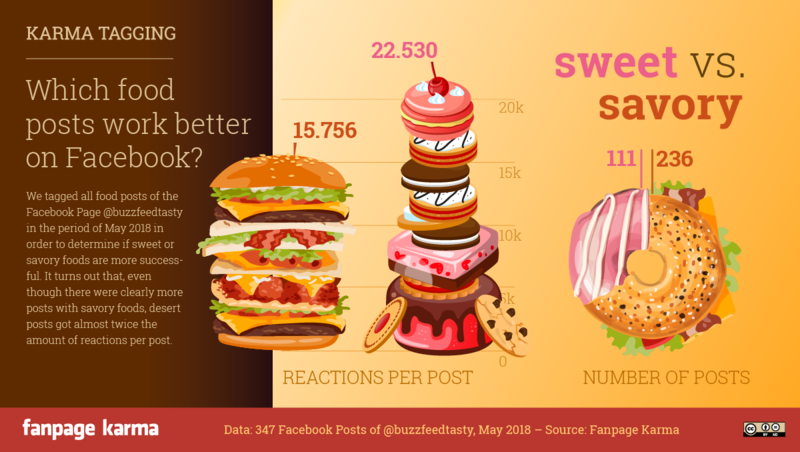 To find out whether posts with hearty dishes, like pizza, steak and currys, or sweet dishes, like cakes, ice cream and brownies, are more successful on Facebook we analyzed the content of Buzzfeedtasty. We had a look at every post of the page in the time period of May 2018 and labeled them with the tags “sweet” or “savory” to examine which of the categories engages users the most. You will find our infographic at the end of this article. With 94 million fans the Facebook Page Buzzfeedtasty is one of the biggest in the food section. We were able to assign our tags to 347 of the 663 posts the page posted in May. The rest of the posts did not clearly fall under one of the categories “sweet” or “savory”. This could either mean posts about beverages, food fails, memes or posts that show both dinner and dessert at the same time. We came to the following results..
Burger, pizza, pasta, meat and cheese cheese cheese. There were a lot more posts with savory foods. About two-thirds of the tagged posts of Buzzfeedtasty showed hearty dishes. However, Tasty Users showed way more action for brownies and co. The sweet posts were shared and commented on a lot more. And they got a lot more reactions per post (like, haha, wow, angry, sad and love) than the posts with savory content.